Frankfurt am Main, 20 September 2018 – 400 attendees, 38 speakers, and over 8 hours of interactive talks and discussions on industry trends, innovation, and new technologies. In its second year, FUTURE: PropTech covered a number of topics and initiated dialogue on the industry’s future. 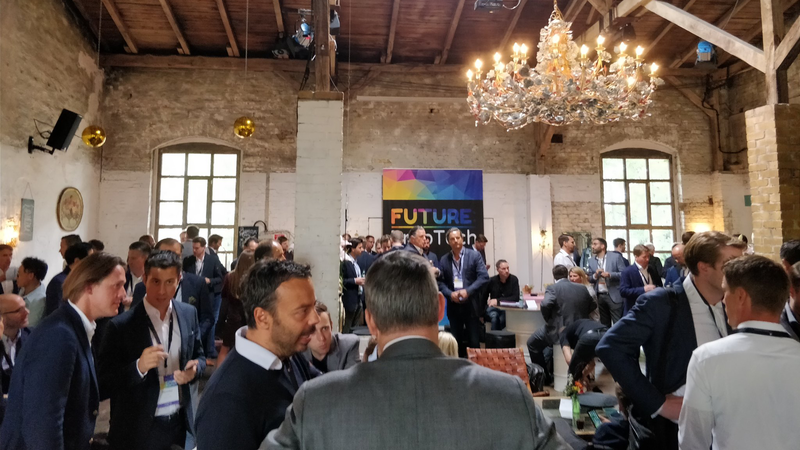 Investors, Real Estate Professionals and PropTech founders from 18 countries came together in Berlin, with “Von Greifswald”, which previously played host to the premiere of the pan-European conference last year, hosting the event again. It allowed the attendees to interact quickly and easily while switching back-and-forth between the two stages in an unconventional setting. Within the framework of the event, a newly founded pan-European initiative introduced itself. Under the term “PropTech House”, leading PropTech-experts from Holland, Belgium and Poland joined forces to build a strong transnational interest-network. The goal of the initiative is to award innovative digital business models across the EU. They will be supported in their efforts by a non-profit industry organization, the German PropTech Initiative (gpti). This year, the organizer blackprintpartners conceptualized two themes for FUTURE: PropTech Berlin, “Prop” and “Tech”. “Prop” gave insights into how large corporates from within and outside the Real Estate industry successfully innovate and tackle the challenges of digitalization. While “Tech” focused on the latest trends and technologies in the PropTech space, such as big data and artificial intelligence, allowing the different aspects and potential of digitalization to be discussed. Through the purposely designed event app, the attendees could also ask questions throughout the event. Coen van Oostrom, CEO of EDGE technologies, showed in his keynote speech the potential of data to conceptualize more intelligent and modern properties. The world needs “better buildings” to meet the growing needs concerning sustainability and new workplace models”, says van Oostrom. “Because of this, data becomes more and more important. We can all use it appropriately.” Through the analysis of data and by using sensors in rooms or areas of a building, it will be possible to control and manage energy costs more precisely. Prof. Dr. Viktor Grinewitschus from EBZ Business School emphasized the meaning of data and its systematic analysis, to increase the efficiencies of residential properties. “In prospect, buildings will play a significant role in the energy system”, Grinewitschus says. At FUTURE:PropTech he presented the exclusive results of a two-year study which the “Allianz für einen klimaneutralen Wohngebäudestand” carried out under his supervision. His conclusion: Digitalization encourages climate protection, as it helps to manage buildings holistically. Dr. Manfred Alflen, Chairman of Aareon, Jörn Stobbe, CEO of Union Investment Real Estate and Sascha Klaus, CEO of Berlin Hyp discussed how to get their own companies in line for digital change and testing new approaches to optimize current processes and develop their own portfolio further. These high-level decision makers offered honest insights, ideas, and experiences, which in the end did not always result in the outcome they wished for. The message: A certain risk is always part of the process. Every step in the digital future is a step in the right direction. Dr. Titus Albrecht, CEO of realxdata, shows that the exhaustion of potential digital trends like big data in Germany and Europe is currently still at its beginning. In comparison to the USA, certain data is still not available to the same extent. Through this, the USA can offer different conditions for new business models. The honesty of the market players is decisive when addressing the way to the digital asset, emphasized Maurice Grassau, CEO of Architrave. Bettina Stark-Watzinger, member of the German Bundestag, talked about what politically must change so that innovation can catch on in Germany, and not get left behind internationally. “The good economic situation makes us lazy” – says Stark-Watzinger. Even though the pressure of China and the USA is huge. “We eventually will need a digital ministry and a digital plan”, the politician demands. However, it is decisive that “we cannot create more bureaucracy for our country”.